Irrigation and its issues associated with the various devices on the market were mentioned in a previous article on this blog  and (but), to date, there has been no further innovation, except for some studies on laser-assisted techniques (PIPS) . However, there are still doubts about their efficacy, especially if we take into account the cost-benefit ratio. As for As for new sealers (bioceramics), please refer to a further article that will deal with their characteristics and instructions for use. In this article, we are going to describe the innovation brought to product research, regarding Ni-Ti instruments. Dealing with instruments and instrumentation, the most worrying issue is the risk of fracture to which they are subject. Unless we are dealing with native structural imperfections (creep fracture) , first of all, we have to take into account the accumulation of cyclic fatigue to which the instruments are subject , and the torsional stress produced during cutting maneuvers. Of course, the shaping quality goes hand in hand with the cleaning quality, because as long as cleaning is carried out , irrigants can penetrate and clean canal walls. In order to reduce the stress to which the instruments are subjecsubject there was an initial attempt to modify the traditional continuous rotation movement by introducing reciprocating movementsreciprocating movements . 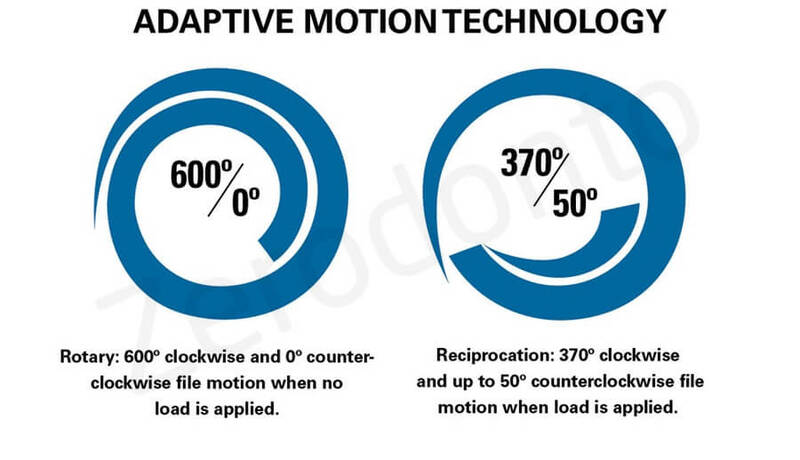 Considering that some studies claim that the reciprocation lengthens the life of instruments [26,30], some companies produced motors with specific movements, which increasingly reduce stress against canal wall, by creating dedicated movements as in the systematic Adaptive Motion Technology ™ (Kerr)  or Optimum Torque Reverse ™ (Morita)  (Fig.3-4). The aim is to reduce the surface contact of the instrument with the canal walls by preventing the blades from reaching stress point which may cause their deformation and breakage. This happens mainly because all the instruments we are dealing with, work with higher or lower torque, depending on the instrument design. However, these devices have not led to the resolution of the above mentioned problems. Therefore, an attempt was made to improve the efficacy of the instruments, by processing Ni-TI bars with altered thermal cycles. 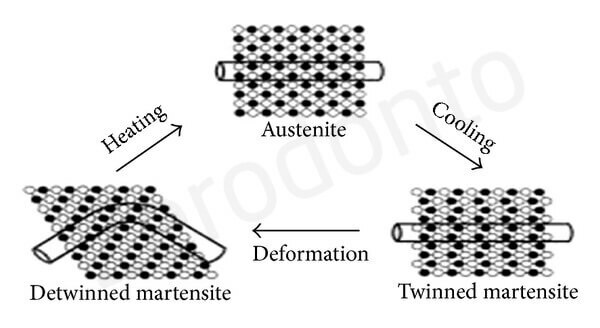 This allowed various companies manufacture instruments , with an Martensitic-Austenitic transition (Fig5) occurring at temperatures which are different from the past ; they are more flexible and have a definitely higher tolerance of cyclic and torsional fatigue(than the past) [33,34], even if at the expense of cutting capacity. This led to the manufacturing of M-Wire ™ (Dentsply-Tulsa DentalSpecialities & WDV), R-Phase ™ (Kerr), CM-Wire ™ (ColtèneWhaledent), Blue ™ (Dentsply-Tulsa DentalSpecialities), Gold ™ (Dentsply-Tulsa DentalSpecialities) and Max-Wire ™ (FKG) : they were characterized by a martensitic—austenitic phase transformation point at different temperatures, thus obtaining instruments able to work in the martensitic phase at room temperature and return to the austenitic if heated and brought to their phase transformation point. This way, the Ni-Ti polycrystalline structure is found at room temperatures in more plastic phases which, depending on the various commercial specifications, give individual instruments their characteristics. 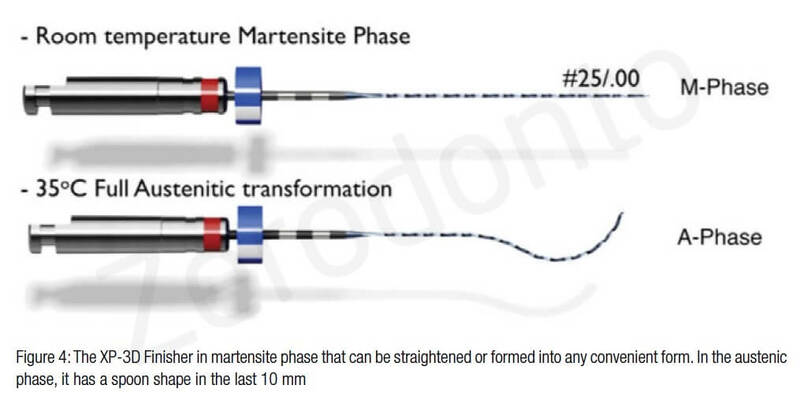 From a clinical point of view, this turns into the opportunity to use files with a predominant Martensitic phase in curved channels and to choose instruments with a predominant Austenitic phase in all cases requiring greater rigidity of the instrument itself (calcified canals and retreatment). The use of these new alloys makes it possible to increase the security level while using the instruments , and to reduce the apex transport likely to occurr;  However, there are still problems. 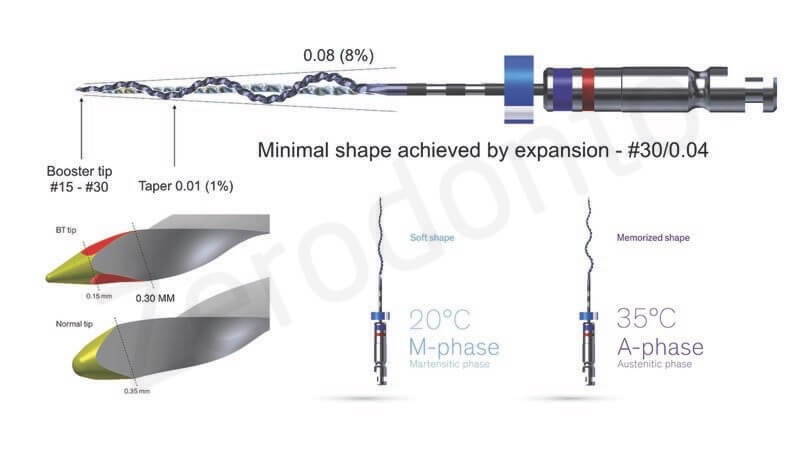 The possibility to create dentinal micro-cracks during treatment at high torque has been reduced but not eliminated , [29,38] (Fig7), moreover, in some cases, the excessive flexibility of some instruments goes to the detriment of their cutting efficiency, but above all, an improvement of percentage of cleaned canal surface, mainly in oval canals, has not been achieved yet. (Fig8) . Apart from these two categories of instruments, there are also “expandable” instruments, wich are able to adapt themselves to the canal anatomy without causing any alteration, but trying to reach as large a surface as possible, due to their morphological characteristics. “GentleFIle System” (MedicNRG,Kibbutz Afikim, Israel). 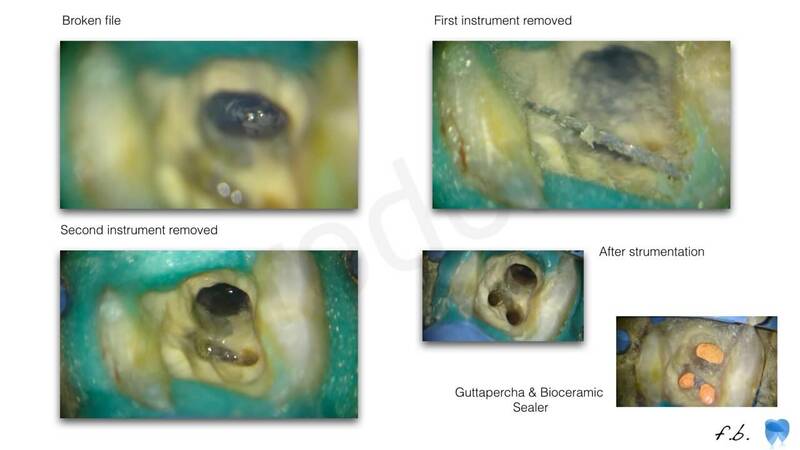 As early as 2010, ReDent-Nova launched on the international market the SAF ™, , which revolutionized the concept of cleaning and shaping, by manufacturing an instrument that broadens the contact area within canal walls, thus cleaning up to 70%-80 % of the endodont. 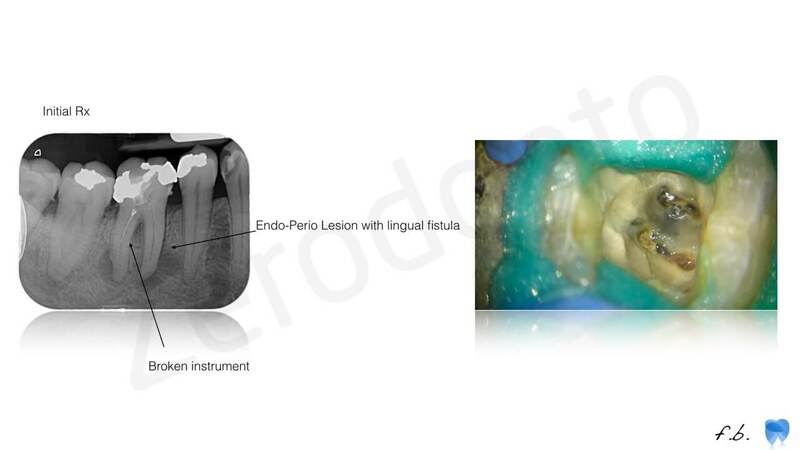 In 2015, FKG manufactured an equally singular file, the XP-Endo-Finisher ™ (XPEF), which was born with the purpose of refining the canal after the shaping phase, in order to increase the effect of irrigants and improve smear-layer removal from the walls (fig1). Unlike the SAF @,it can be used without a dedicated motor, and it works as a finisher at the end of an ordinary canal instrumentation sequence. The instrument comes in a rigid plexiglass box, at the ends of which there are millimeter notches which make it possible to calculate the working length (LDL) before inserting the file inside the canal. The instrument diameter is ISO # .25 and its taper is equal to 0. It is used at speeds of 800-1000 rpm at a torque of 1 as it does not perform any active cutting action. Considering not only the hypochlorite activation action but also the action of contact with the canal walls, the XPEF has proven to be the most effective in almost all situations (video2). Only in some cases it has proven to have a detergent capacity comparable to PUI, although in some work  it was not specified whether the irrigation solution was maintained above 35 ° C, a prerequisite to getting maximum performance from the instrument. The comparative analysis between XPEF and the latest generation Ni-Ti instruments on the ability to disrupt biofilm confirmed that the latter still left a portion of unremoved bacteria in statistically significant values ​​[1,9]. Further analysis was carried out on the amount of debris ejected from the apex during processing and it was estimated that the only working action of the XPEF does not produce significant debris  (comparable to the amount of pulp produced by the SAF) but it is the pre-operational operating sequence that determines a greater production. Similar conclusions were drawn in this study by PUI, but the latter method only works to increase the action of the irrigants, but not to disaggregate the biofilm on the walls. A study by Azim et al  evaluated the hypochlorite extrusion that could be caused by using XPEF, considering its swirling movement within the endodont, and it has emerged that comparing to Endovac@ the discharge of hypochlorite is bigger, but comparable to that of other systems in use such as Endoactivator @. Clinically, it was also attempted to evaluate the possibility of removing gutta-percha from the canals using the XPEF at the end of ordinary sequences and, as already shown for the removal of dressing pastes, the file proved to be very effective [4,17] with statistically significant values, but still dependent on the maneuvers previously performed. 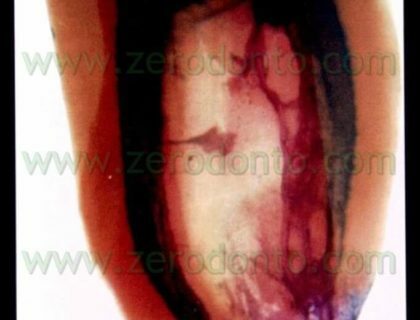 Unfortunately, the need to use preparatory methods before using XPEF did not solve the problem related to, for example, the formation of dentin crack, or the massive production of debris; as in some studies [3,17] the final quality of the result was often affected by the initial preparation performed. 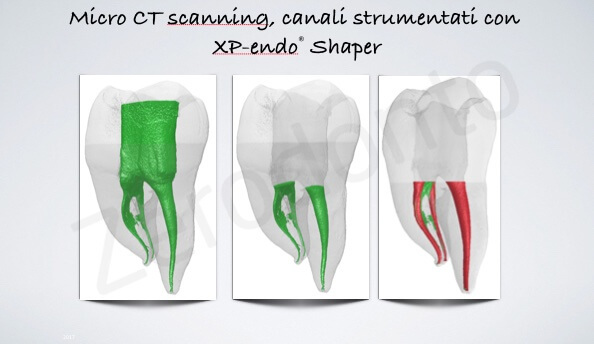 To solve some of these problems, and to better define the concept of three-dimensional canal shaping, in 2016, FKG introduced on the market an instrument for shaping the entire endodontic: XP-Endo-Shaper ™ (XPES). The instrument is still manufactured in Max-Wire ™ alloy, but has a 4% taper and an ISO # .30 apex. The anatomy of the instrument is unusual; in fact it is not the classic conical instrument that impresses its shape in the canal, but it has waves throughout its body which, during the expansive rotation phase, make the instrument impact the canal surface in the best way (Adaptive Core Tecnology). 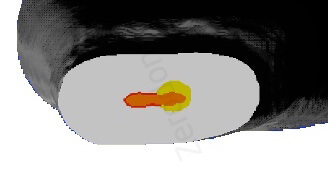 Initial studies carried out on micro CTs show how XPES can come into contact with most of the canal walls (fig. 7-8), and how it improves the cleansing of all the ovoid section apices. 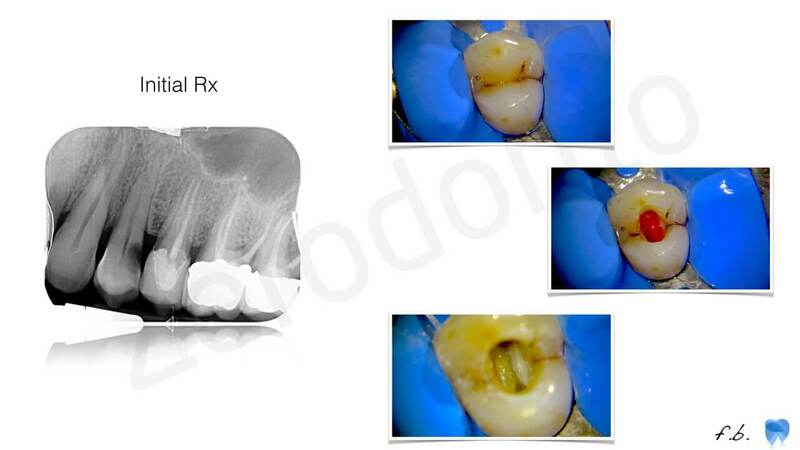 Moreover, considering that it works with a minimum torque (1 Nw), the risks of creating a dentin crack are minimized (video5)  and above all, the amount of debris produced by the processing is minimal (fig9). As with the XPEF, its austenitic shape is maintained above 35 ° C, so irrigants must maintain this temperature to have an optimal performance. 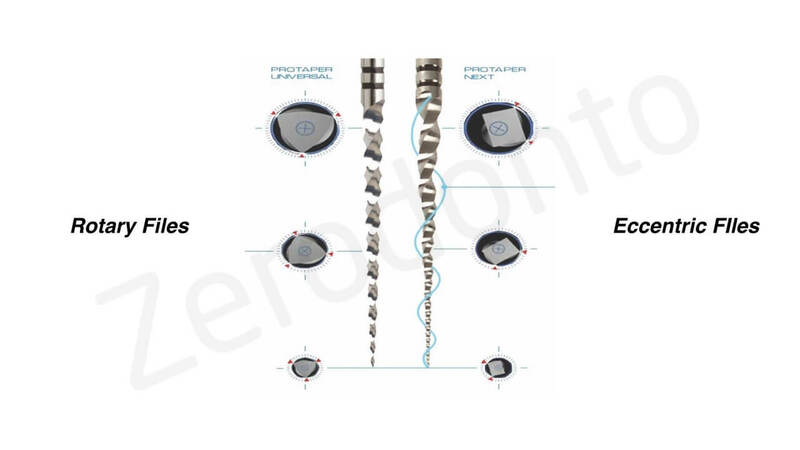 From torsional tests, XPES is rather delicate when compared to Flex-Master ™ (VDV), Pro-file Vortex Blue ™ (Dentply-Tulsa), and True Shape ™ (Dentsply-Tulsa)  but this is due to the own nature of the file, it does not need a torsional resistance because it does not work engaging in canal walls. Its swirling movement does not allow the blades to engage in dentin, and this produces less stress on the walls and gives a greater amount of free space inside the canal in which the action of the irrigants can be better performed. 84% of free space created (compared to 46% of a conventional instrument) allows the debris to be suspended? And and helps to discharge them with the irrigants . In the studies, the best results were obtained by continuous irrigation during the milling phase, both with XPEF and with XPES. The instrument does not want to be a single file and contemplate an initial pre-flaring that has a dual function. 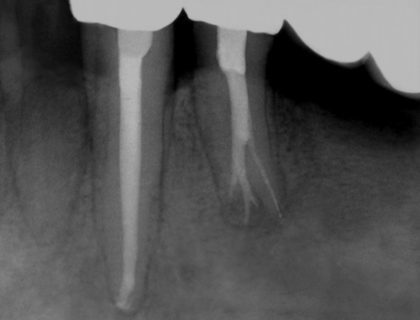 Firstly, the creation of an initial glidepath: especially if performed with rotating instruments [35,43] it minimizes the risk of altering the natural endodontic anatomy by also reducing the stress of the larger instruments. Secondly, it is possible to reach a diameter of ISO # .15 (minimum 2% conicity) that allows the subsequent introduction of XPES. The method involves coming and going movements from 3 to 5 times, trying to reach the apex. If this doesn’t work, the instrument is extracted and cleaned, the canal irrigated, and the same sequence restarts; Once LDL is reached, 10 up-down movements are to be performed along the canal. This operation will give the canal the expected conicity and # .30 diameter. In 2017, FKG completes the range of these instruments with one dedicated to retreatment : the XP-EndoFinsher-R ™ (XPEF-R). 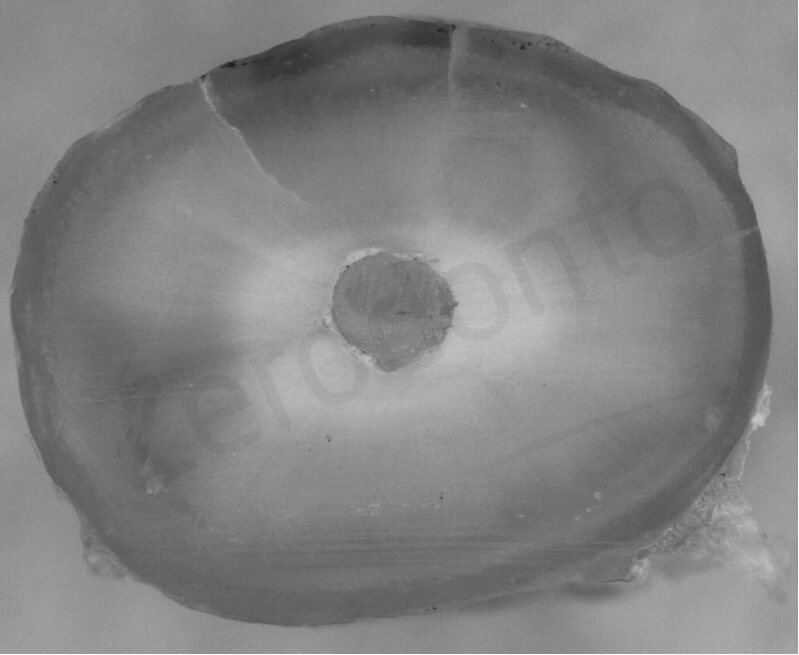 The XPEF and XPES capability of removing gutta-percha has already been appreciated previously, with this new instrument with a stronger core than XPEF and a diameter of ISO.30 # in top (Fig10), the quality of cleaning would be superior , although some studies indicate that the difference in gutta clearance between XPEF and XPEF-R is not statistically significant . 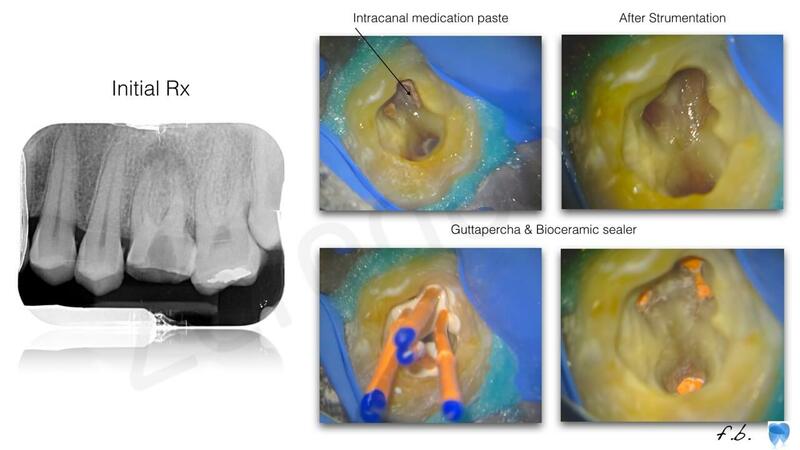 Once the canal is shaped and cleaned at best , it is possible to proceed with the closing phase using conventional methods, even if, in order to create a three-dimensional seal, this instrumental technique is well conceived both a conceptual and a clinical view by using bioceramics as sealer. In addition, this eliminates the problem of the contraction of the material after cooling, which is known to be the cause of gaps on the canal walls, which can fail (Video 9). 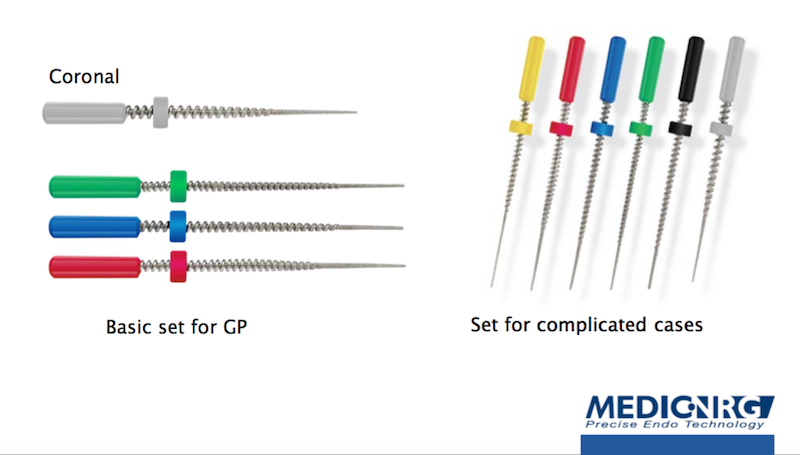 Compared to the SAF and to the XP-Endo series, the Gentlefile (GF), is the one with the least “expandable” anatomical characteristics. In fact, the instrument does not adapt strictly to the canal by compressing (squeezing) itself, but it exploits the rotation speed and the centrifugal force to reach the canal as close as possible. Moreover, the instrument manufacturing bucks the trend, compared to latest instruments. As a matter of fact, It is not made from NITI alloy, but from steel and characterized by a series of layers of spiral wrapped wires on a central stem. The apical section is more flexible and varies depending on the diameters examined. 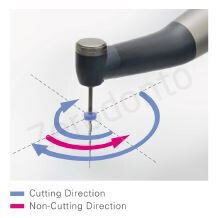 The surface roughness and the high rotation speed enables a close contact as possible, thus resulting in homogeneous and conservative removal of dentin. The procedure implies the use of a set of 6 instruments , to be chosen depending on the type and complexity of the canal treated. The set also includes a finishing file (Finisher), which is used at the end of the shaping phase in order to improve the final cleaning , remove biofilm from the walls, thus enhancing the quality of subsequent canal filling. The whirling effect which the irrigant undergoes (Tornado Disinfection System) enhance the penetration depth of hypochlorite into tubules and ensures a thorough cleaning, also evaluated by SEM analysis. The finisher is characterized by steel fibers in the apical third; they open up, taking the shape of a brush, which ensures a conservative cleaning, without altering canal anatomy. Unfortunately, only one study on the procedure has been reported in literature; it demonstrates how GF, compared to rotating NiTi instruments (Pro Taper Next, Revo- S), it has the same, but often a higher performance level, especially if we take into account cyclic fatigue resistance tests. 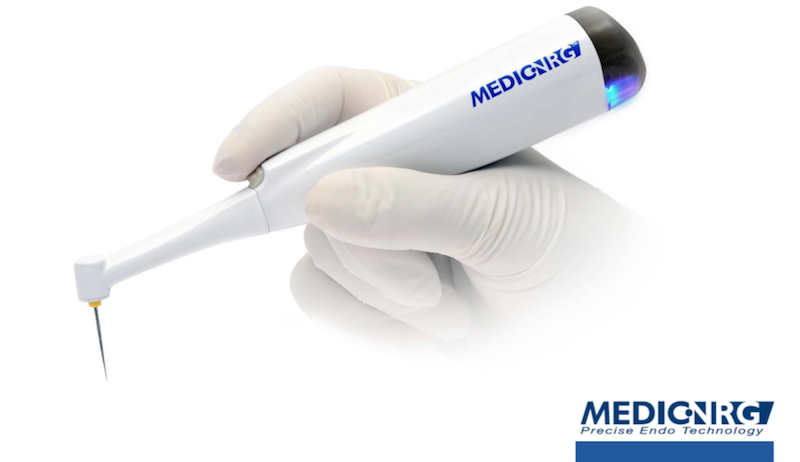 The set also consists of a cordless handpiece with disposable heads (Fig. 3), which enables to get the right torque and rpm from the instrument ( the torque value is not specified by the manufacturer). Unfortunately a clinical trial of the procedure has not been possible, since distribution is not guaranteed in Italy and in a large part of Europe and North America. 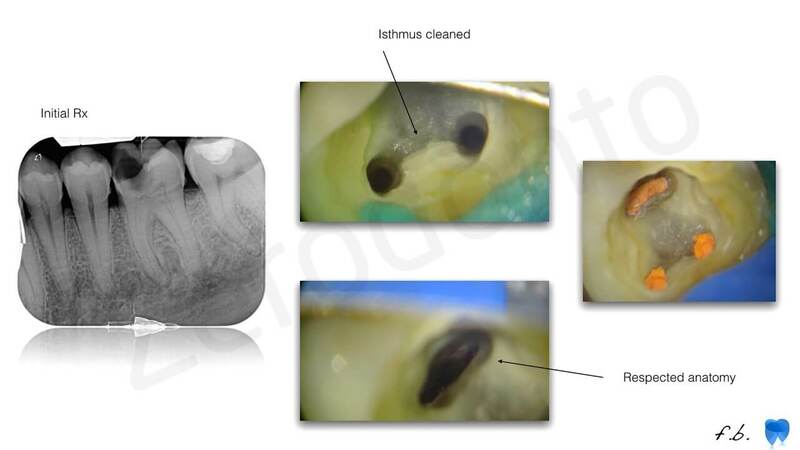 Clinical experience and research teach us that there is not yet a perfect method and a universal instrument to perform an endodontic treatment that makes it possible to clean the whole canal, but recent achievements have certainly allowed us to move forward in order to reduce the risks of failure and increase healing percentage. 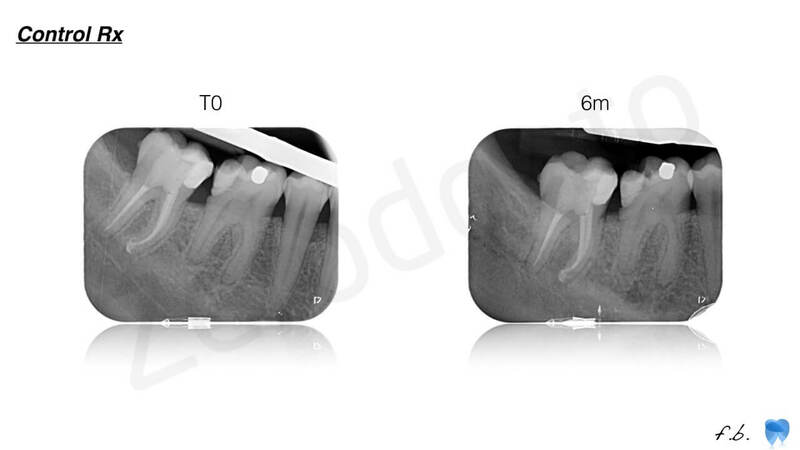 with the Xp Endo system, combined with easiness of use and the results highlighted by literature, is very promising. 1– Adjunctive Steps for Disinfection of the Mandibular Molar Root Canal System: A Correlative Bacteriologic, Micro- Computed Tomography, and Cryopulverization Approach. Alves FR, Andrade-Junior CV, Marceliano-Alves MF, Pérez AR, Rôças I, Versiani , Sousa Neto , Provenzano JC, Siqueira JF Jr.
Endod. 2016 Nov;42(11):1667-1672. doi: 10.1016/j.joen.2016.08.003. Epub 2016 Sep 15. 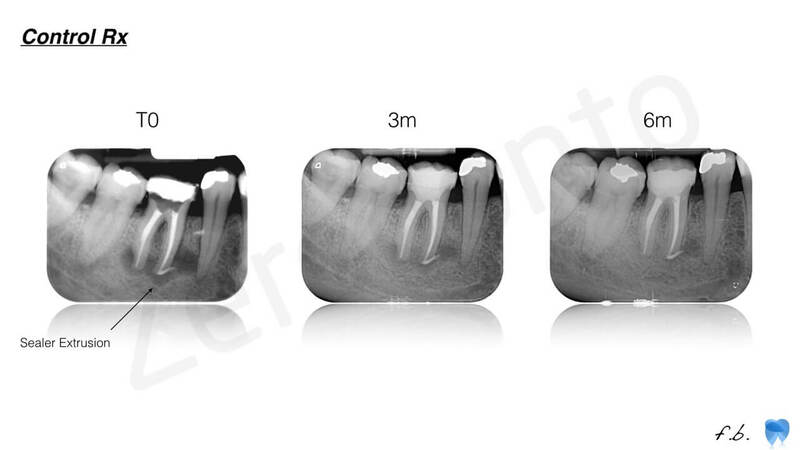 2–An in vitro evaluation of various irrigation techniques for the removal of double antibiotic paste from root canal surfaces. Gokturk H, Ozkocak I, Buyukgebiz F, Demir O. 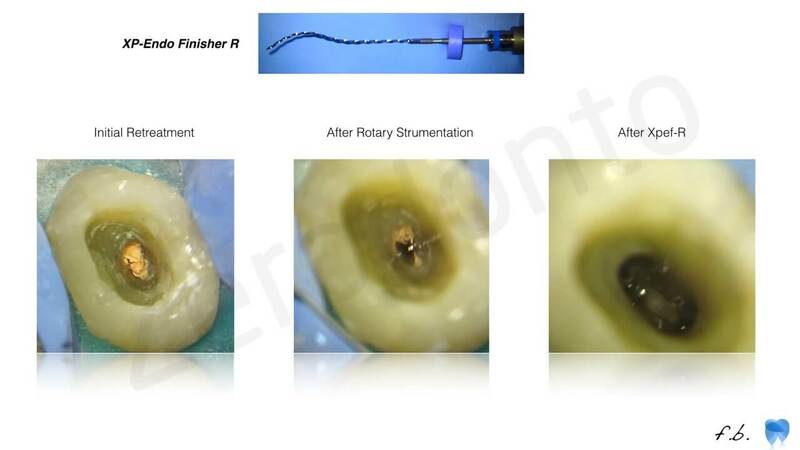 3– Apical extrusion of debris during the preparation of oval root canals: a comparative study between a full-sequence SAF system and a rotary file system supplemented by XP-endo finisher file. 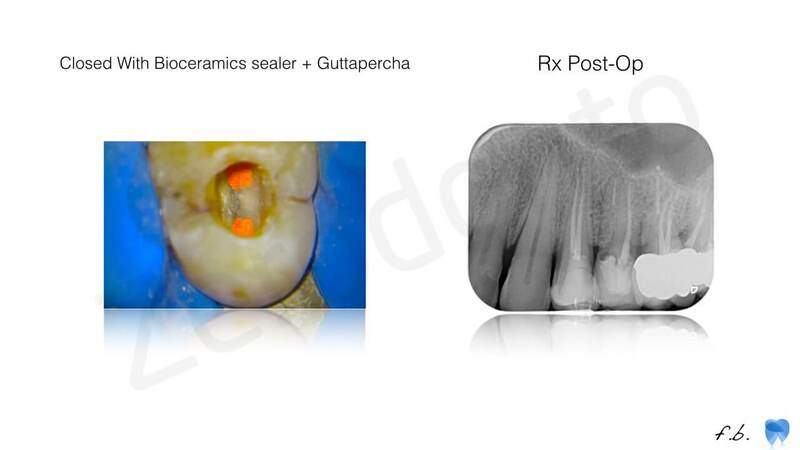 Kfir A, Moza-Levi R, Herteanu M, Weissman A, Wigler R.
4 – Cleanliness of Canal Walls following Gutta-Percha Removal with Hand Files, RaCe and RaCe plus XP-Endo Finisher Instruments: A Photographic in Vitro Analysis. Karamifar K1, Mehrasa N1, Pardis P1, Saghiri MA2. Iran Endod J. 2017 Spring;12(2):242-247. doi: 10.22037/iej.2017.47. 5– Comparison of sodium hypochlorite extrusion by five irrigation systems using an artificial root socket model and a quantitative chemical method. Azim AA, Aksel H, Margaret Jefferson M, Huang GT. 6– Effectiveness of various irrigation protocols for the removal of calcium hydroxide from artificial standardized grooves. 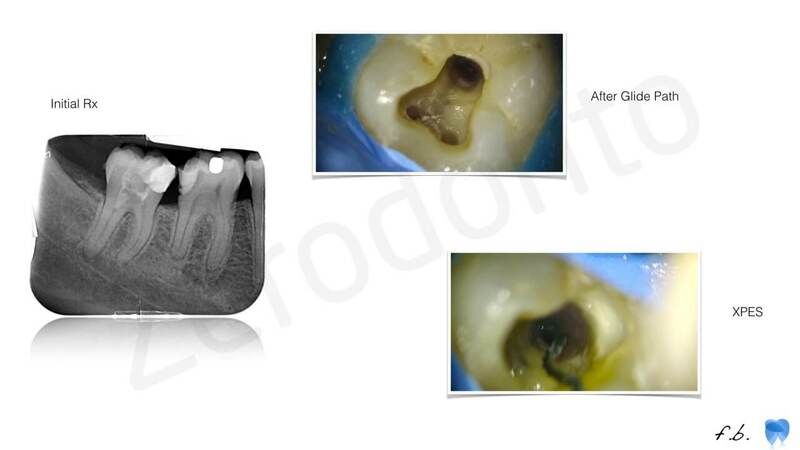 7– Effectiveness of XP-endo Finisher and XP-endo Finisher R in removing root filling remnants: a micro-CT study. Silva EJNL, Belladonna FG, Zuolo AS, Rodrigues E, Ehrhardt IC, Souza EM, De-Deus G.
Int Endod J. 2017 May 3. doi: 10.1111/iej.12788. 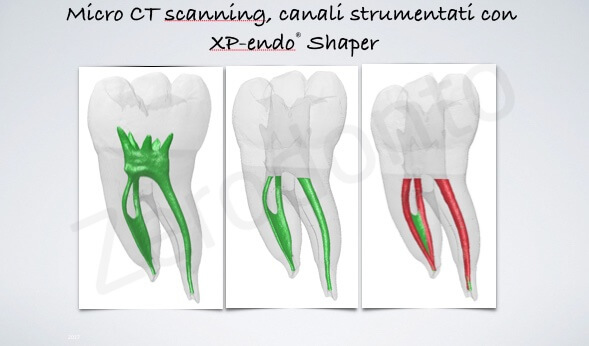 8-Effectiveness of XP-endo Finisher, EndoActivator, and File agitation on debris and smear layer removal in curved root canals: a comparative study. Odontology. 2017 Apr;105(2):178-183. doi: 10.1007/s10266-016-0251-8. Epub 2016 May 20. 9-Efficacy of 4 Irrigation Protocols in Killing Bacteria Colonized in Dentinal Tubules Examined by a Novel Confocal Laser Scanning Microscope Analysis. 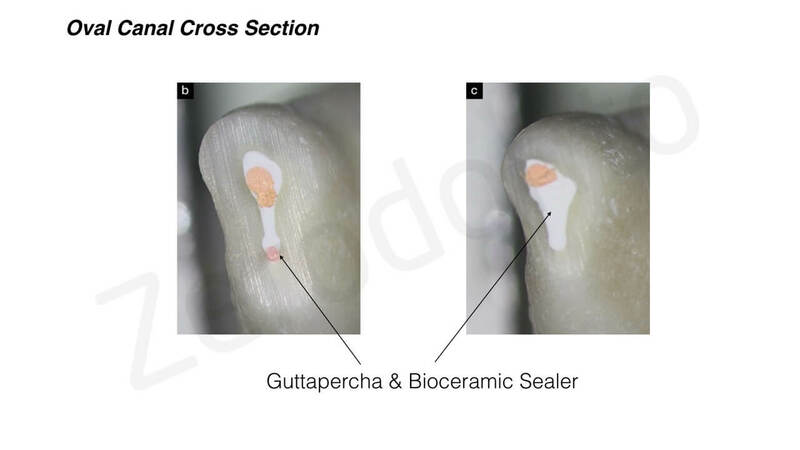 10– Efficacy of self-adjusting file, XP-endo finisher and passive ultrasonic irrigation on the removal of calcium hydroxide paste from an artificial standardized groove. Kfir A, Blau-Venezia N, Goldberger T, Abramovitz I, Wigler R.
Aust Endod J. 2017 Jun 23. doi: 10.1111/aej.12204. 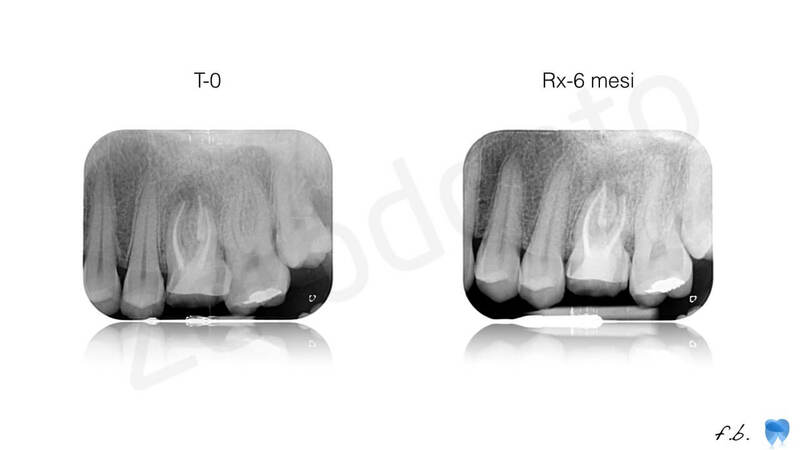 11– Efficacy of XP-endo finisher and TRUShape 3D conforming file compared to conventional and ultrasonic irrigation in removing calcium hydroxide. Uygun AD, Gündoğdu EC, Arslan H, Ersoy İ. Aust Endod J. 2016 Nov 12. doi: 10.1111/aej.12176. 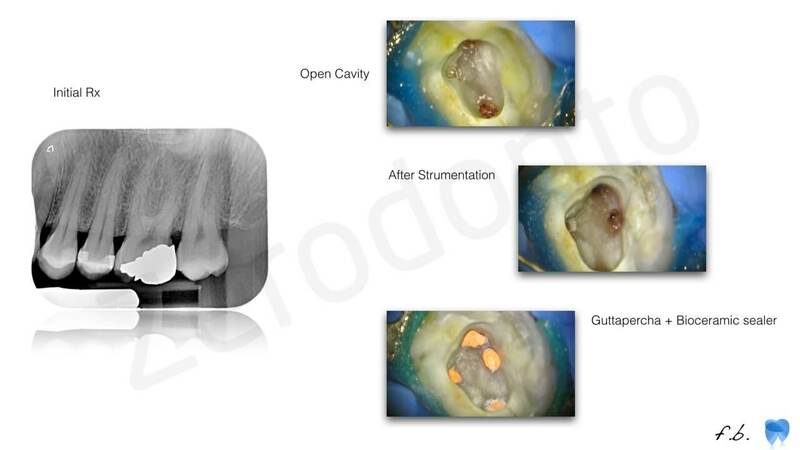 12– Efficacy of XP-endo Finisher File in Removing Calcium Hydroxide from Simulated Internal Resorption Cavity. Keskin C, Sariyilmaz E, Sariyilmaz Ö.
J Endod. 2017 Jan;43(1):126-130. doi: 10.1016/j.joen.2016.09.009. Epub 2016 Dec 6. 13-Efficacy of XP-endo finisher files in the removal of calcium hydroxide paste from artificial standardized grooves in the apical third of oval root canals. Wigler R, Dvir R, Weisman A, Matalon S, Kfir A.
Int Endod J. 2017 Jul;50(7):700-705. doi: 10.1111/iej.12668. Epub 2016 Jun 25. 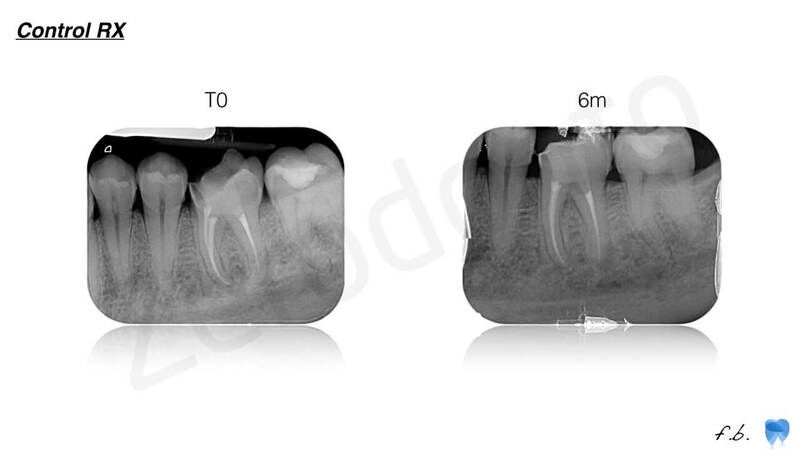 14– Efficacy of XP-Endo Finisher in the Removal of Triple Antibiotic Paste from Immature Root Canals. 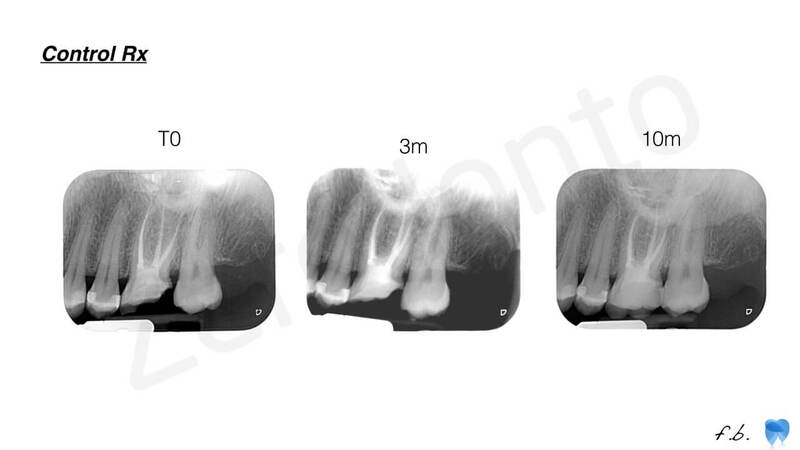 Turkaydin D, Demir E, Basturk FB, Sazak Övecoglu H.
15– Ex vivo evaluation of four final irrigation protocols on the removal of hard-tissue debris from the mesial root canal system of mandibular first molars. Int Endod J. 2017 Apr;50(4):398-406. doi: 10.1111/iej.12630. Epub 2016 Apr 8. 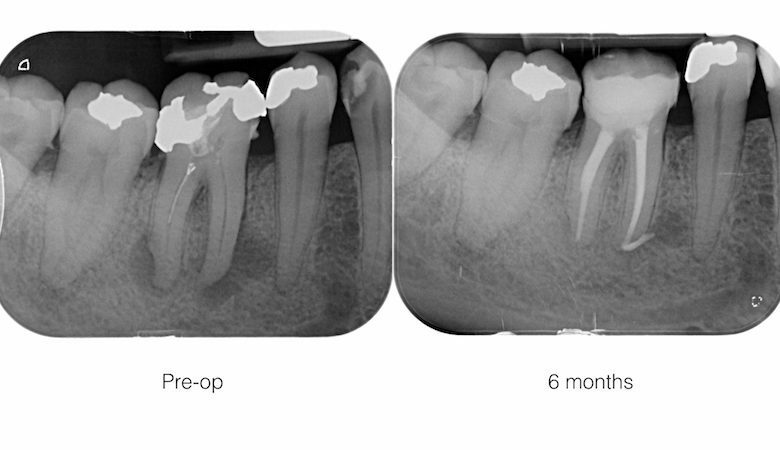 16– In Vitro Efficacy of XP-endo Finisher with 2 Different Protocols on Biofilm Removal from Apical Root Canals. 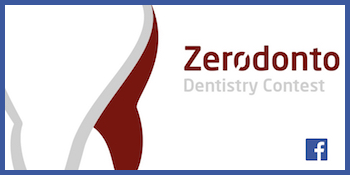 17–Removal of Root Canal Fillings in Curved Canals Using Either Reciprocating Single- or Rotary Multi-instrument Systems and a Supplementary Step with the XP-Endo Finisher. Alves FR, Marceliano-Alves MF, Sousa JC, Silveira SB, Provenzano JC, Siqueira JF Jr.
J Endod. 2016 Jul;42(7):1114-9. doi: 10.1016/j.joen.2016.04.007. Epub 2016 May 20. 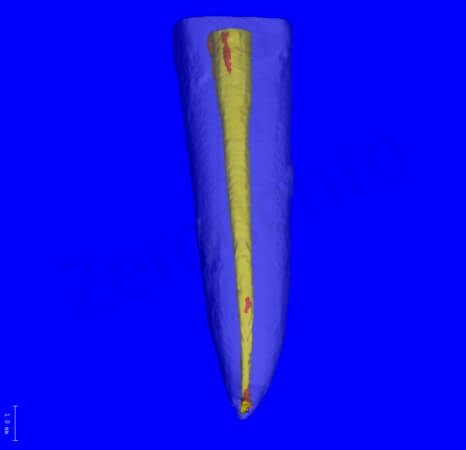 18– Effect of ProTaper Gold, Self-Adjusting File, and XP-endo Shaper Instruments on Dentinal Microcrack Formation: A Micro-computed Tomographic Study. J Endod. 2017 Jul;43(7):1166-1169. doi: 10.1016/j.joen.2017.02.005. Epub 2017 May 2. 19– Torsional resistance of XP-endo Shaper at body temperature compared with several nickel-titanium rotary instruments. Int Endod J. 2017 Jul 12. doi: 10.1111/iej.12815. 21– Cleaning the third dimension. 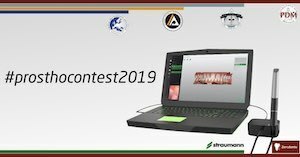 Pedullà E., Cosentino G., Ambu E., Rovai F., Campedelli F., Rapisarda S., La Rosa GR., Rapisarda E., Grandini S.
35– Computed Micro-Tomography evaluation of glide path with nickel-titanium rotary PathFiles in maxillary first molars curved canals. 36-. 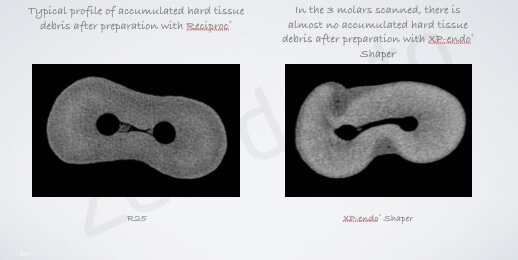 Accumlated hard tissue debris levels in mesial roots of ,mandibular molars after sequential irrigation steps. 37– Preparatinj of oval-shaped root canals in mandibular molars using Ni-Ti rotary instruments: A micro-computed tomography study. Paqué F, Ballmer M, Attin T, Peters OA. 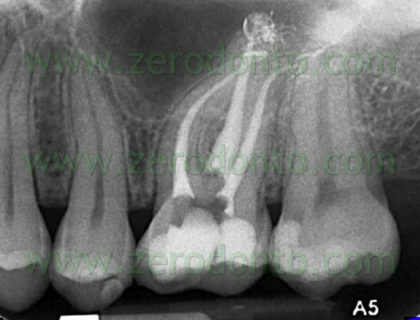 38– The effects of canal preparation and filling on the incidence of dentinal defects. Shemesh H, Bier CA, Wu MK, TanomaruFilho M, Wesselink PR. 39-Analisys of apical root trasportation associated with Pro taper universal F3 and F4instruments by using digital subtraction radiology. Kunert GG, Camargo Fontanella VR, de Moura AA, Barletta FB. 40-. Preparatinj of oval-shaped root canals in mandibular molars using Ni-Ti rotary instruments: A micro-computed tomography study. 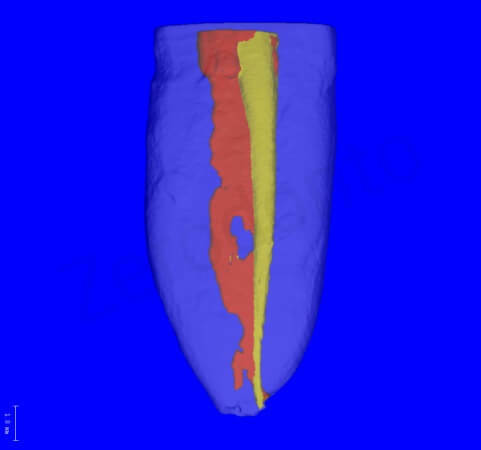 41– Micro computed tomography evaluation of the preparation of long oval root canals in mandibular molars with SAF. 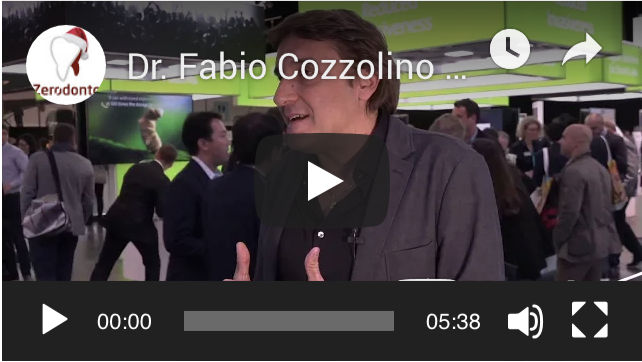 Born in Bologna (Italy), 1962, April 7th Graduated in Medicine and Surgery (6 years) in 1989 –University of Bologna.Master in Endodontics in 1998 - University of FlorenceProfessor of Endodontcs (2002-2011) – Dental School – University of Modena and Reggio EmiliaChairman of Post-graduate course of Endodontics in 2003-2004 - University of Modena and Reggio EmiliaVisiting Professor of Post-graduate course of endodontics from 2006 to 2008 – Dental School – University of BolognaVisiting Professor of Post-graduate course of endodontics since 2011 – Dental School – University of SienaClinical Assistant Professor of Endodontic Surgery since 2015 – Dental School –University of SienaVisiting Professor of Post-graduate course of endodontics since 2012 – Dental School – University of CagliariVisiting Professor of Post Graduate course of Endodontics since 2013 – Dental School University of Valencia (Spain) Active Member of the Italian Endodontic Society since 1999 (Member of Active Member Admission Commitee 2009-2013)Certified Member of the European Society of endodontology since 2000Active Member of Italian Academy of Endodontics since 2013 (now Member of Cultural Commitee) Author of the Cd-Rom “Manuale di endodonzia clinica e chirurgica” (Ritram publisher, 1999) finalist at the Moebius award (Lugano – CH) in 2000, as the best scientific cd-rom in Italian.Author of the book “Manuale illustrato di endodonzia” (Milan - Masson – Elsevier publishers) in 2003Author of the book “La Patologia endodontica post-trattamento: terapia non chirurgica” (Rome – Agorà publisher) in 2005Authors of the book”3D Radiology in dentistry” (Elsevier, Milan, 2013)Author of the chapter “Radiologia endodontica” in the“Manuale di Endodonzia” of Italian Society of Endodontics (SIE) (EDRA Milan 2013)Author of over 30 short and long papers in Italian scientific literature and in international literature (Journal of endodontics, New Microbiologica and others)Speaker in courses and congresses in Italy and abroad, he performs his activity strictly reserved to Micro-Endodontics and Oral Surgery in Bologna (Italy). Informative post about using the latest generation expanding instruments in endodontic treatment for reducing the risks of failure and increasing healing percentage. Your post would guide a number of dentists. This post would guide a number of dentists. 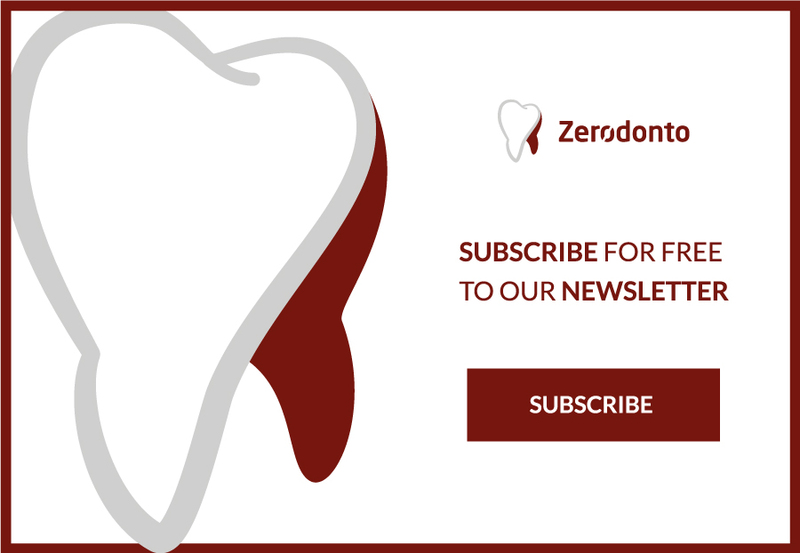 It gives valuable information about using the latest generation expanding instruments in endodontic treatment for reducing the risks of failure and increasing healing percentage. Nice to know about the technological advances in the root canal, I hope there are more such advancements which can make the process simpler, less painful and shorter healing time.